Moderate rain (totál 19.0mm), heaviest el jueves por la noche giving way to a moderate fall of snow, heaviest el jueves por la noche. Freeze-thaw conditions (max 13°C el jueves por la tarde, min -3°C el sábado por la noche). Wind will be generally light. A light covering of new snow, mostly falling el domingo por la tarde. Freeze-thaw conditions (max 7°C el martes por la tarde, min -3°C el domingo por la mañana). Wind will be generally light. La tabla anterior muestra el pronóstico de tiempo para Manigod en la altitud específica de 1480 m. Nuestros modelos meteorológicos sofisticados permiten prever pronósticos para la cumbre, la mitad y la base de Manigod. Para aceder a los pronósticos de tiempo a otras alturas, pinche en la navegación en la parte superior de la tabla. Para una visión general, consulte el Mapa meteorológico de France. I skied in Manigod on Friday 17 Feb. 2017. Actually Manigod belongs to the allied ski centers of La Clusaz. This means that with one ticket you can ski more interconnected ski centers. Distance from Geneva bus station 1h and 15 min. I took Beauregard gondola and started from Beauregard mountain. Then you can continue to Manigod ski center, where I actually spent almost all my day. There was about 130 cm of snow. However, the ski center has a low altitude. As a result the snow suffered from high temperatures. The resort managers warned about hard snow. However, in Manigod there was nowhere hard snow. In the contrary: till 1 pm snow was ok, after was soft. The ski center is really easy. It is a good place to learn how to ski. There are some red pistes, but nothing difficult. I have particularly enjoyed the red Myrtilles and Grand Chamois and Sorbiers. Bois Manigod is a nice piste as well among pine trees, however, the snow there was awful. What I have most enjoyed there was the atmosphere. The ski center was full mainly with French families. It was like a holiday and this made me happy. At the end of the day it started raining. La Clusaz is a pretty but small village. 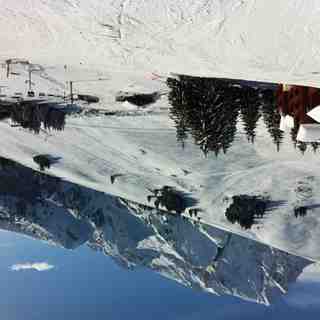 I would suggest La Clusaz for a short ski trip. Next time I would like to visit Aiguille and Etale mountains.